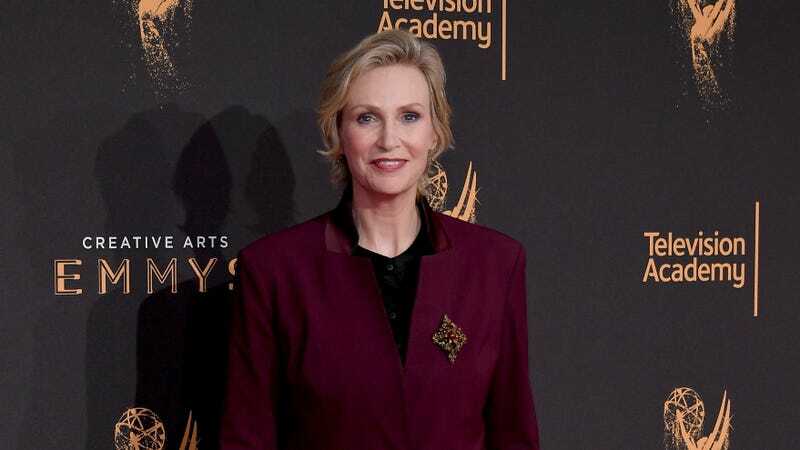 Post-Glee, the world of scripted television hasn’t been particularly kind to Jane Lynch. Her CBS show Angel From Hell was killed after only a few episodes last year, and over the summer NBC passed on the Relatively Happy pilot which featured Lynch in a role that was specifically rewritten for her. Now, in an apparent rejection of scripts in general, Lynch has begun developing a daytime talk show with Telepictures—the studio behind Ellen. This comes from Deadline, which says the project is still in its early stages, but it’s expected to be a “feel-good, variety show” that will be feature Lynch’s “comedic take/spin on everything from pop culture moments to real people with unique, uplifting stories.” Also, it apparently won’t have celebrity guests, but it will be filmed in front of a live audience. Deadline notes that talk shows with famous hosts haven’t had a lot of success lately in general, but the ones hosted by comedians/general funny people—like Ellen or The Wendy Williams Show—do tend to do the best.